Dining at Sheba restaurant in Brick Lane for the first time, the vegetarian Vindaloo I had ordered turned out to be the spiciest Indian food I had ever eaten. This was odd, considering I am Indian and had certainly had my share of spicy food. The Vindaloo is most certainly an Indian dish, but its spice quotient has become exaggerated in Britain. In fact, Indian food in Britain – served in every Indian restaurant down the road or around the corner – is not very Indian at all. Most ‘Indian’ restaurants have chefs from other countries in the subcontinent. 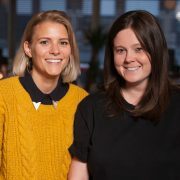 They may be Bangladeshi or Pakistani or Indian, but more importantly, they are British citizens who have never had the experience of cooking Indian food in the Indian way. The result of their work is not the creation of Indian food, but Anglo-Indian food. Thankfully, there are several restaurants that do feel the need to employ chefs from India so that they can cook up original curries. Some restaurants also import their ingredients from India, all in the pursuit of authenticity. Aside from the Chicken Tikkas and the Bombay Aloos – the latter entirely unheard of in India – the food that is lesser known comes from South India. While North Indian food typically consists of meat and potato gravies to be eaten alongside naans, the cuisine of south India includes rice batter crepes (Dosas) and steamed rice cakes (Idlies) that are usually eaten alongside vegetable lentil soups and chutneys. Punjabi restaurants serve authentic north Indian food, but these are rarely located in east London, with the exception of Punjab58 in Stoke Newington. This is why Brick Lane’s restaurants would be the best bet in the area for anything that closely resembles north Indian food in terms of taste. 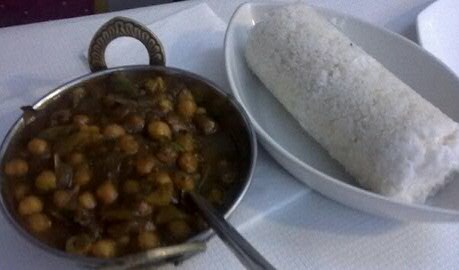 The hub for South Indian food along the east London Line is Croydon, with its large south Indian and Sri Lankan migrant population. 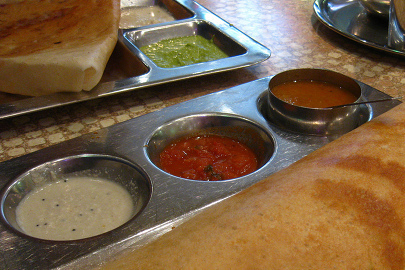 Chennai Dosa opened its Croydon branch in the area five years ago, and the franchise provides a sumptuous all-you-can-eat breakfast buffet consisting of every popular south Indian dish. If you are not the kind to stuff yourself in the morning, the lunch buffet offers similar choices. Mini idlies with Sambhar (lentil and vegetable stew) is perfected here, as is the famed Masala Dosa – a thin rice crepe wrapped around potato curry. 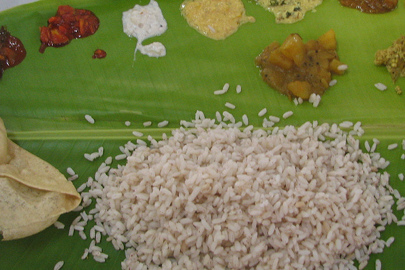 The Puttu Kadala – rice with a side dish of curry and the Avial – vegetables prepared in coconut and yoghurt would transport anyone to the taste of God’s own country, as Kerala is often called. Not too far away, on Lower Addiscombe Road, there is a restaurant with a 22-year-old legacy in providing Croydon with the best Indian food. The Banana Leaf has an award-winning chef and a never-empty restaurant to boast about. Manager Tony Abraham tells me: “About 80 per cent of the customers are English.” The Chicken Chettinadu and meat specials are the most popular with this audience, Abraham says. Their resident chef Thirumugam Sundaram , who moved to the UK in 2002 , is credited with preparing masala-laden cuisine originated in the Chettinad region of Tamil Nadu state in South India. The coconut rice and the okra curry are also certain favourites with vegetarians. The restaurant even serves the seafood that is unique to the state of Goa.